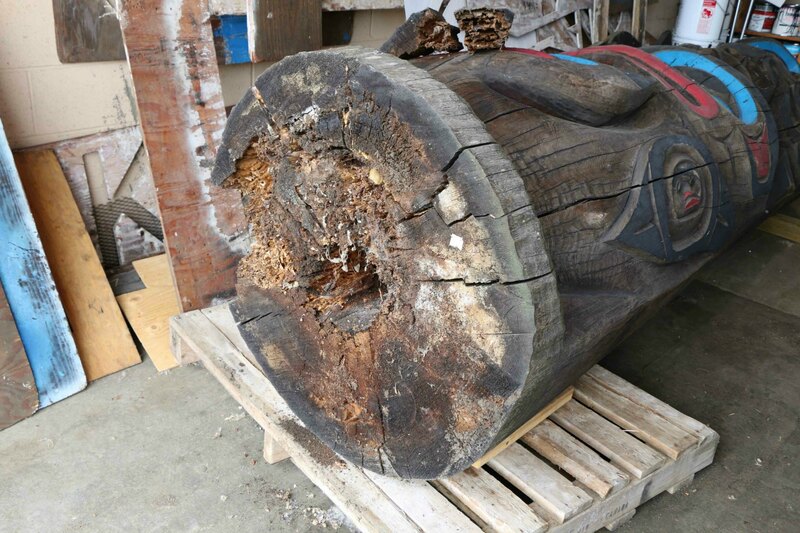 As we reported in a previous post in February 2016, four totem poles from the City of Duncan totem pole collection have been removed from public display and are currently being stored in a City of Duncan facility, awaiting maintenance. 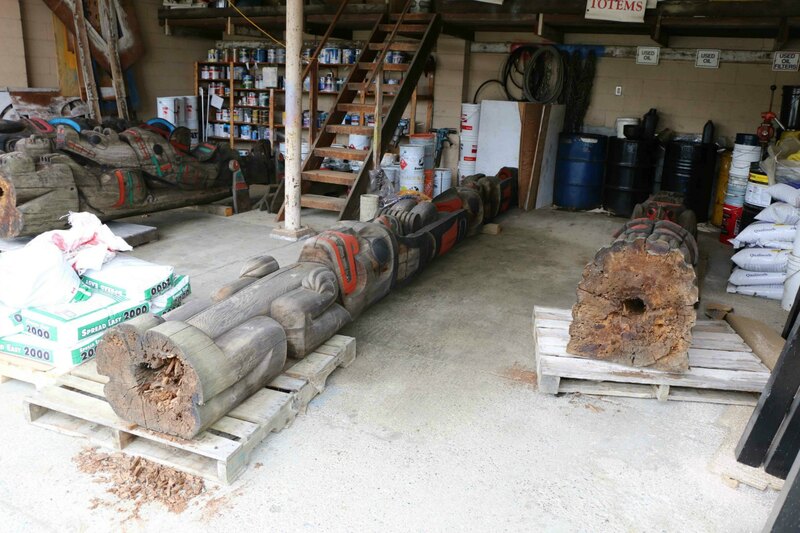 Four City of Duncan totem poles in a city maintenance facility, May 2016. These four totem poles are: Pole of Wealth, The Feast, Eagle Raven Bear and Raven Stealing The Sun. 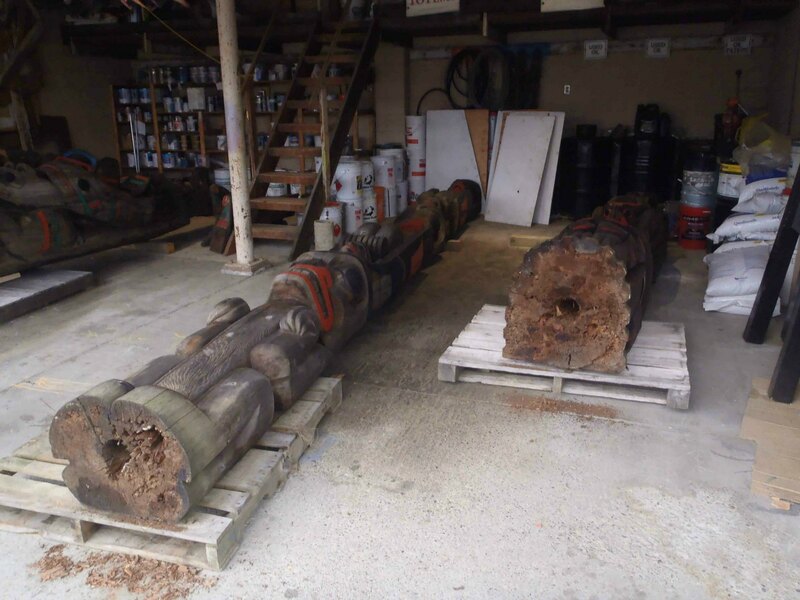 The Feast (background) and Pole of Wealth (foreground) in a City of Duncan maintenance facility, May 2016. Pole of Wealth was carved in 1988 by Norman John and is usually displayed in China Garden at the intersection of Government Street and E.J. Hughes Place. The Feast is usually displayed on the east side of Canada Avenue between Kenneth Street and the Cowichan Valley Museum, located in the former E&N Railway Station. Eagle Raven Bear totem pole during maintenance, January 2016. Eagle Raven Bear is usually displayed at the intersection of Government Street and Station Street. Raven Stealing The Sun was carved in 1990 by Don Smith and is usually displayed at the south west corner of Canada Avenue and Station Street. 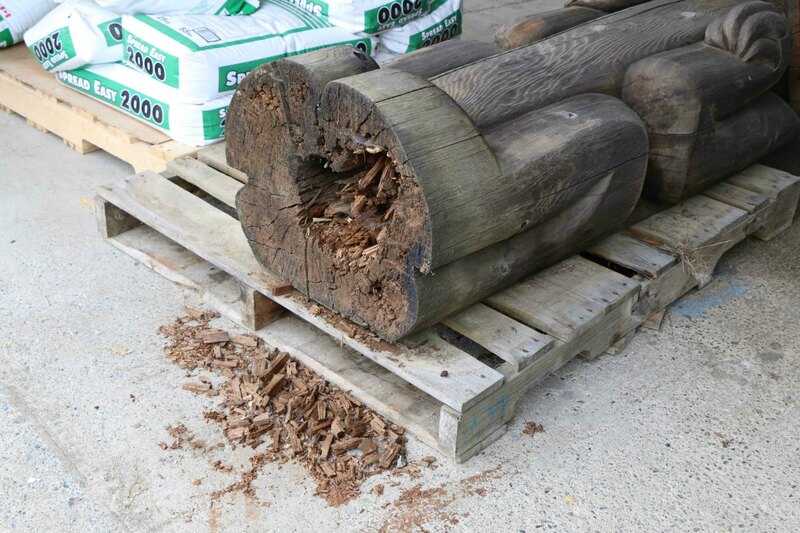 The most pressing maintenance issues with these four poles are ant damage and wood rot inside the poles. 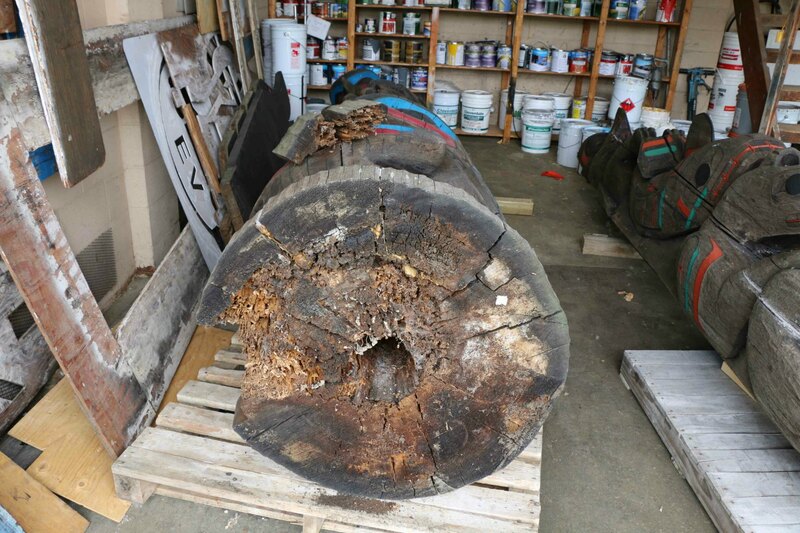 The photo below shows the damaged wood left on the concrete support stand beneath Pole of Wealth after the totem pole was removed for maintenance in December 2015. The photo below shows the bases of The Feast and Pole of Wealth during maintenance. 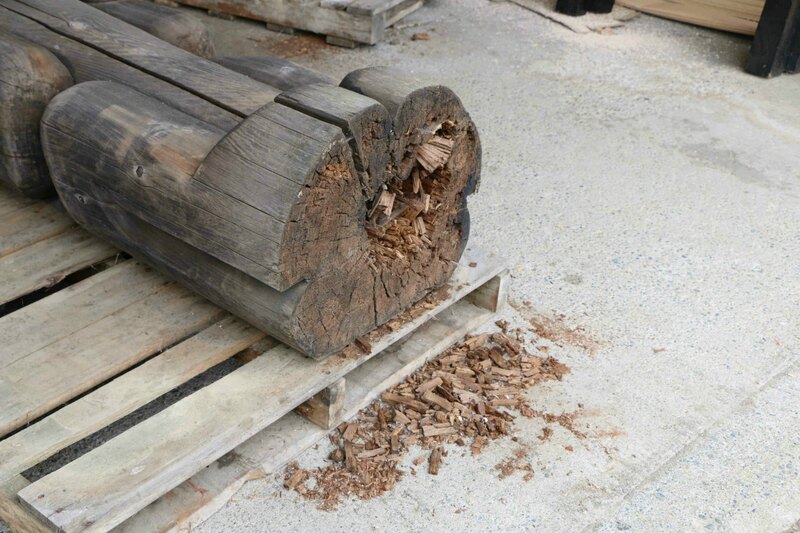 Damage to the wood on the base of The Feast (left) and Pole of Wealth (right), May 2016. 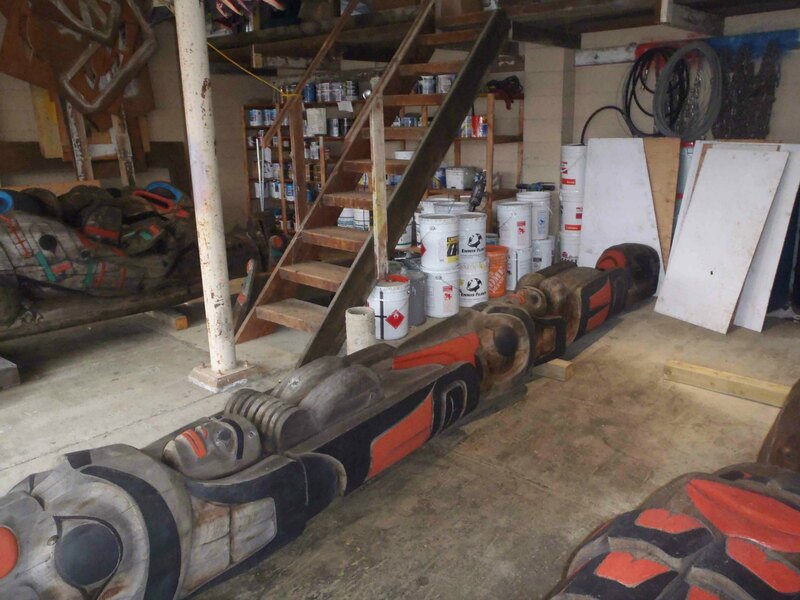 The photo below shows the bases of Eagle Raven Bear and Raven Stealing The Sun in the City of Duncan storage facility where the pole are currently located. 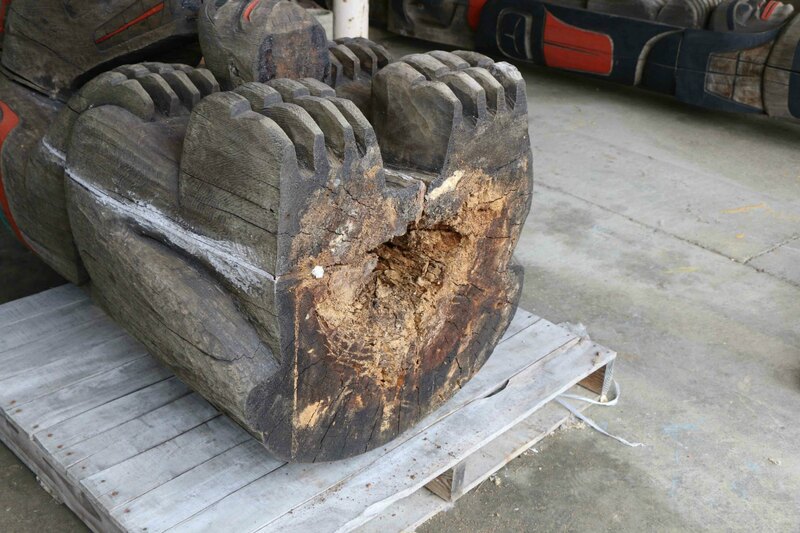 Damaged wood can be clearly seen on the floor at the base of each totem pole. 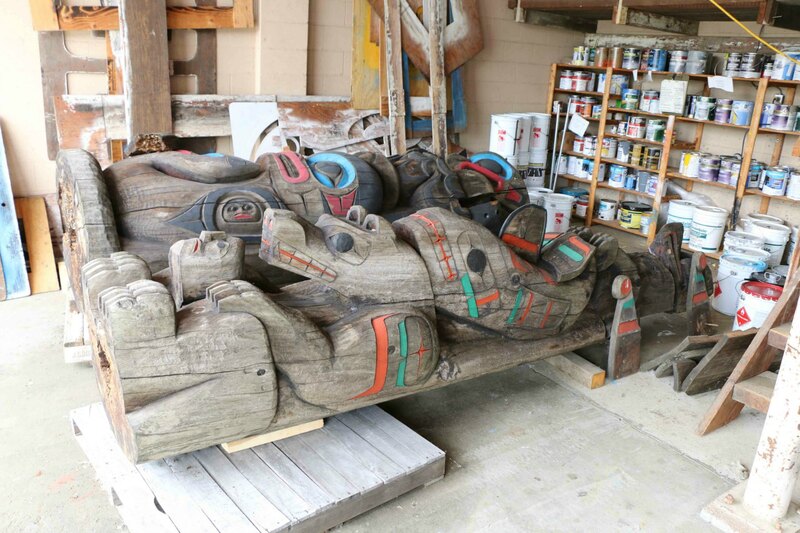 Eagle Raven Bear and Raven Stealing The Sun totem poles during maintenance, January 2016. 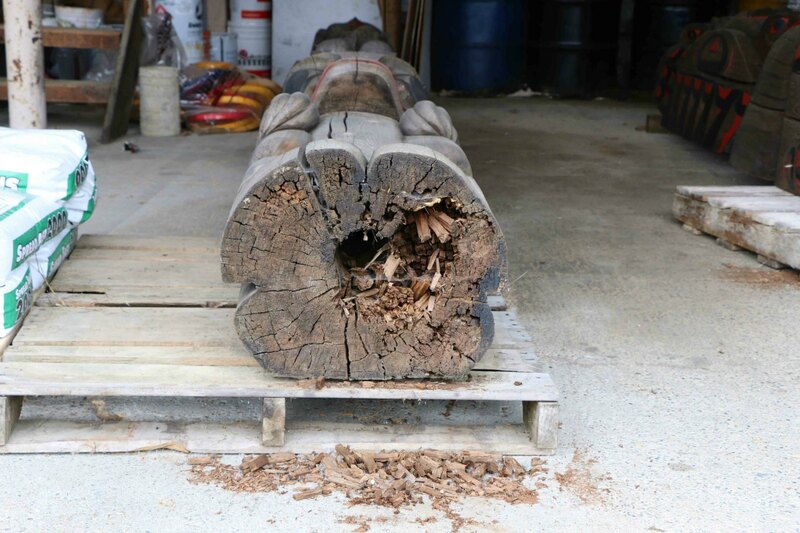 The planned maintenance of these four totem poles involves treating the base and the inner portion of the support hole for rot and ant damage. The base of The Feast, May 2016. The base of Pole of Wealth, May 2016. 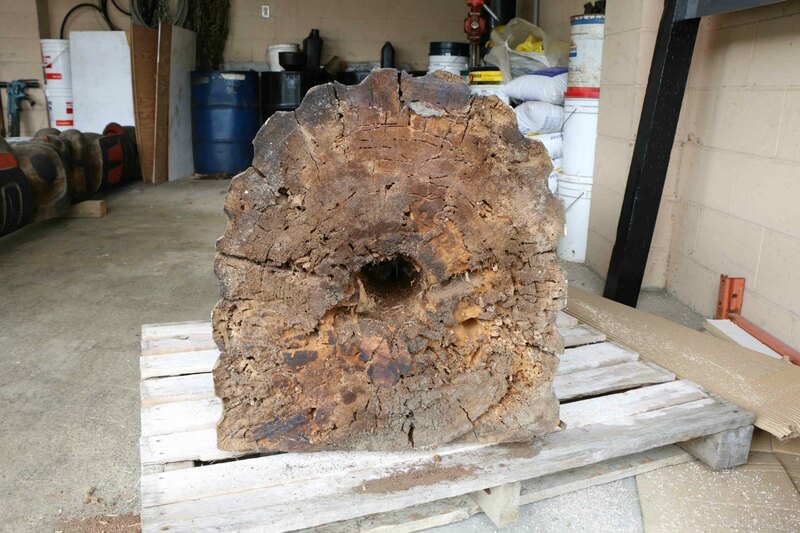 The base of Eagle Raven Bear, showing damage to wood, May 2016. The base of Raven Stealing The Sun, May 2016. 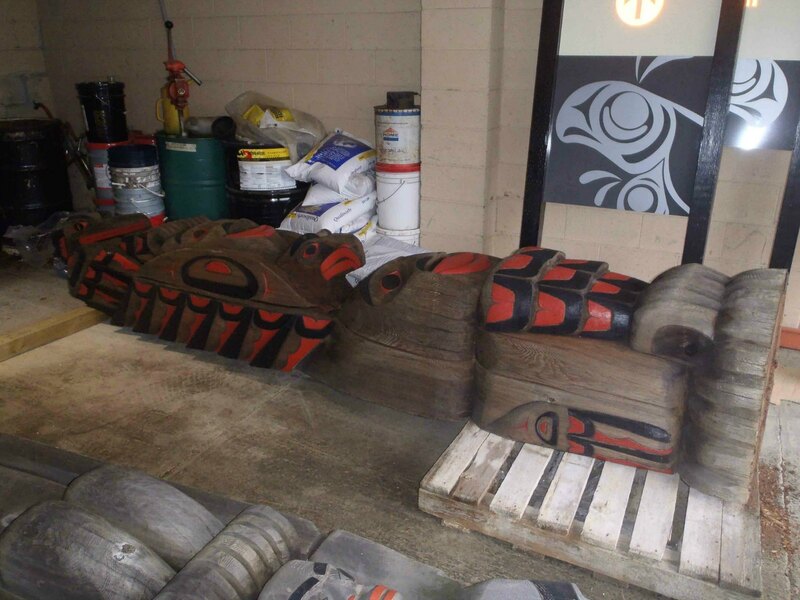 The City of Duncan is also planning to have these four totem poles repainted while they are being treated for wood damage. 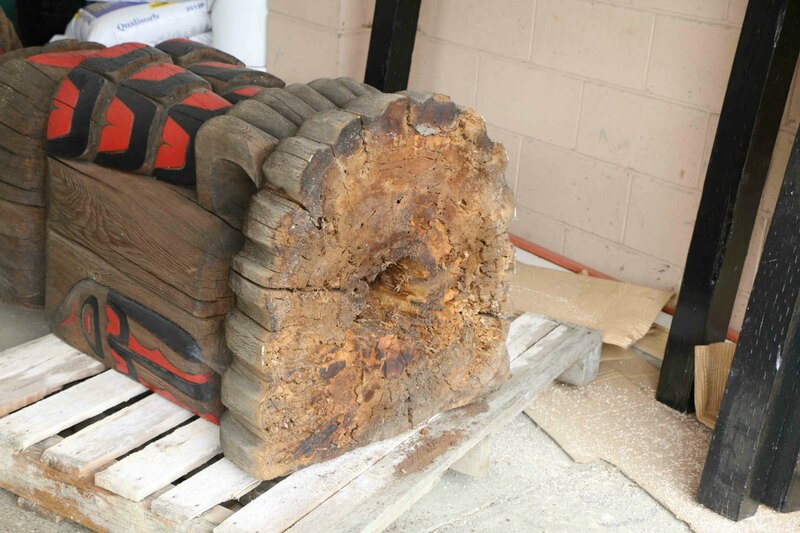 To make it easier to treat the City of Duncan totem pole collection for any ant damage and rot while the totem poles are on public display, the City of Duncan has installed hockey pucks under the base of each totem pole in the City of Duncan collection. 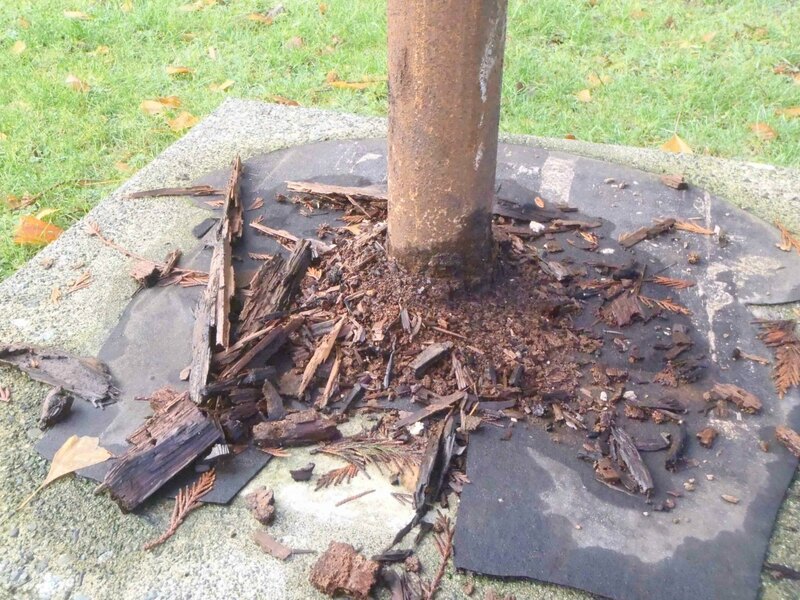 This simple, and inexpensive, tactic raises the base of each pole slightly off the ground, allowing a pest control contractor to insert equipment beneath the totem pole and treat the interior of the pole for ant and insect damage without actually having to remove the pole from public display for pest control treatment. 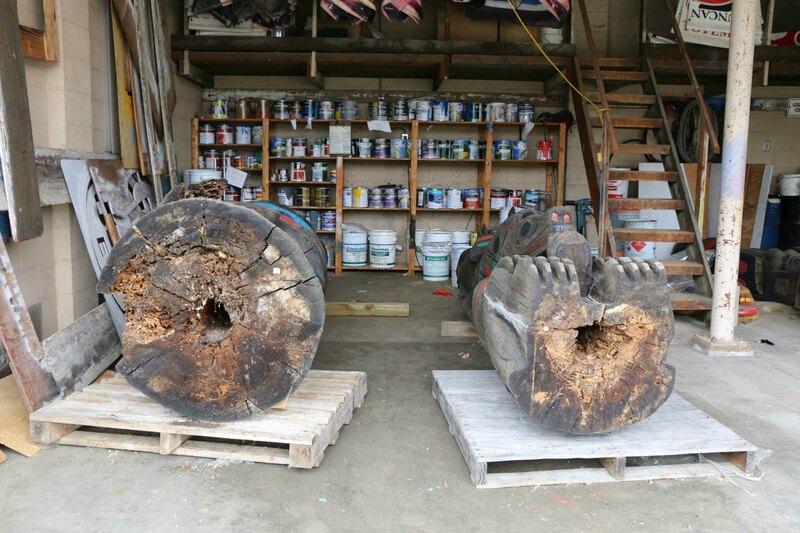 Pole of Wealth, The Feast, Eagle Raven Bear and Raven Stealing The Sun will have hockey pucks inserted beneath their bases when these totem poles are returned to public display later in 2016. We will post future information on future developments. 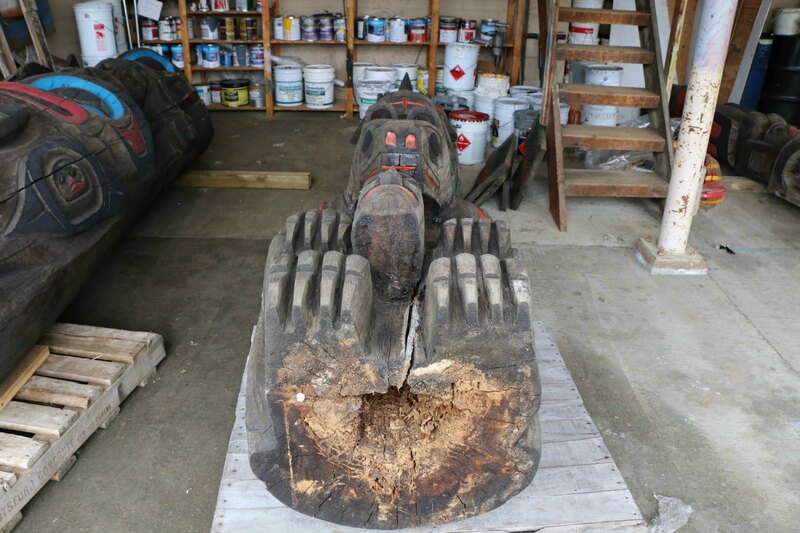 If you would like to take a walking tour of the City of Duncan totem pole collection, see our Suggested Walking Tour of Downtown Duncan Totem Poles.